REACTION TO HOGAN REDISTRICTING PLAN: John Fritze of the Sun reports that U.S. Rep. Chris Van Hollen, a Democrat running for Senate in Maryland, offered a tepid response Friday to Gov. Larry Hogan’s proposal to change the way the state’s congressional districts are drawn, suggesting that the GOP-led Congress should take up national redistricting reform. Van Hollen’s response on the issue came shortly after his opponent in the Senate race, Rep. Donna Edwards of Prince George’s County, seemed to offer a subtly more supportive statement – though she also did not endorse Hogan’s efforts. House Minority Leader Nic Kipke said changing the redistricting system will be a battle. Hogan has given Kipke, as House minority leader, the chance to appoint a commission member. Others who will get that chance are Miller, House Speaker Michael E. Busch, D-Annapolis, and Senate Minority Leader J.B. Jennings of Baltimore County, writes Chase Cook for the Annapolis Capital. The editorial board for the Sun opines that Gov. Larry Hogan took an important step toward fulfilling one of the most important promises of his campaign by naming a commission to come up with recommendations to reform the process by which Maryland redraws congressional and legislative district maps. This promise stands out because his administration is in a position to deliver on a fundamental reform for the cause of good government in a way that might never have happened if he hadn’t been elected. STILL RED OVER RED LINE: Baltimore City officials are making it clear they remain upset about the decision to kill the Red Line light rail route ahead of a meeting with transportation officials to discuss improving mass transit. Officials, including Sen. Barbara Mikulski, Mayor Stephanie Rawlings-Blake and Transportation Secretary Pete Rahn, are scheduled to meet this morning at Maryland Department of Transportation’s headquarters in Hanover. But local officials, just days ahead of the meeting, were still voicing their disappointment in Gov. 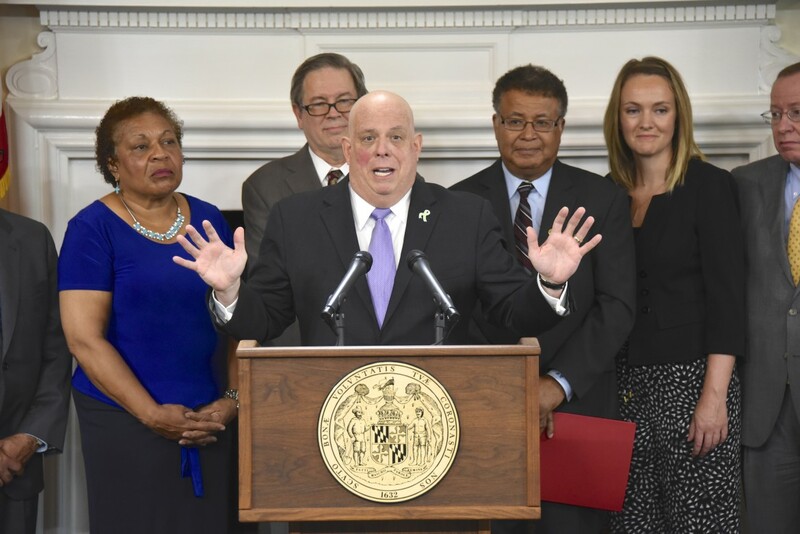 Larry Hogan‘s decision in late June to not pursue the 14.1-mile Red Line, reports Adam Bednar for the Daily Record. MTA EYES $58M FOR MARC ENGINES: The Maryland Transit Administration wants to spend $58 million to buy eight diesel locomotives for its MARC service to replace its fleet of electric engines – welcome news for commuting regulars. MARC’s electric locomotives, powered by an overhead line called a catenary, have been prone to breakdowns, especially in hot weather, writes Michael Dresser for the Sun. SENTENCING LAW: After their son’s convicted killer was let out of jail after serving 15 years of a life sentence time served a family is hoping to change the law. The man was convicted of first-degree murder and conspiracy to commit first-degree murder. He received a life sentence, with all but 55 years suspended. The law allows judges to modify the sentences of persons convicted of crimes. Those sentence reductions can occur if defendants file motions within 90 days of sentencing asking for the sentence to be revised, Tim Pratt reports the story for the Annapolis Capital. PENSION CONFUSION: For Maryland’s 388,500 state workers and teachers – active and retired – interpreting the pension news these days is confusing business. Item: Over the past 12 months, the state’s pension fund gained 2.68% on its investments. Is that good or bad? On June 30, the fund’s market value stood at $45.8 billion, a gain of $400 million over the prior fiscal year. All well and good. But the state failed to come close to hitting its investment target of 7.65% That’s not so good. Welcome to the fuzzy world of actuarial pension and retirement funding, writes columnist Barry Rascovar of MarylandReporter.com. UNAFFILIATED VOTER ROLLS GROW: Tamela Baker of the Hagerstown Herald Mail reports that as the nation gears up for another campaign season, political party membership in Maryland remains lopsided. Statewide, Democrats hold a more than 2-to-1 advantage over Republicans, but in rural areas like Washington County, Republicans hold a commanding lead. While Democrats struggle to win elections in Western Maryland, their fellow party members maintain a stranglehold on the General Assembly. But lately, both parties are having to contend with a different political force: the unaffiliated voter. TANEY BUST CONTROVERSY: Frederick alderwoman is renewing a call for removing a statue of U.S. Supreme Court Chief Justice Roger Brooke Taney from City Hall. Taney wrote the 1857 Dred Scott decision upholding slavery. The ruling became a catalyst for the Civil War. It called black people “beings of an inferior order.” Taney practiced law in Frederick from 1801 to 1823. WBFF-TV and the AP report the story. TO BE YOUNG AND IN THE GOP: Young Republicans aren’t so young, writes Chase Cook for the Annapolis Capital. The group that aims to grow support through youth lets people stay in the organization up to age 40. The Democratic cut-off is 36. With the 2017 Young Republican National Convention set to take place in Annapolis, the Capital turned toward local Republicans to get an idea of what life is like when they were in the youth organization. Turns out it isn’t incredibly exciting, but lawmakers were willing to share a few anecdotes. TAX FREE WEEK: Michaeline Van Reenan and her daughter Emily combed the aisles of Target in Westminster Sunday searching for back to school clothes. “We’re taking advantage of Tax-Free Week,” Van Reenan, of Eldersburg, said, adding, “She just needs a few things for school. We do this every year.” Tax-Free Week runs through Saturday Aug. 15. Michel Elben reports for the Carroll County Times. The week is the result of legislation passed in the 2007 special session of the Maryland General Assembly. For the next week, people who buy qualifying apparel and footwear for $100 or less do not have to pay the state’s 6% sales tax. The deals runs from Sunday to Saturday and does not include accessories. People headed out to downtown Frederick and the Francis Scott Key Mall on Sunday to get their hands on back-to-school items – ready to sport some new outfits for the start of the school year, Rebecca Savransky writes for the Frederick News Post. WAGE PROTEST AT PIMLICO: Bruce Vail of In These Times writes that Pimlico Racetrack workers are protesting low wages. Local governments shower benefits on businesses with the promise of creating jobs and economic prosperity, yet many of the jobs pay so poorly that they trap workers in a cycle of near-poverty, or worse, Vail reports. In the case of Canadian billionaire Frank Stronach, whose company own the Preakness track, as well as other tracks in Maryland, Florida, Oregon and California, the company benefits from elaborate state-sponsored schemes to subsidize the Maryland horse racing industry, with little or no benefit trickling down to the low-income workers who live in the neighborhoods surrounding the racecourses. NEW ROUND OF CHEMO: Gov. Larry Hogan returned to the University of Maryland hospital Friday to begin a new five-day round of 24-hour chemotherapy to treat his cancer. The governor has already undergone two such rounds of chemo in his fight against Stage 3 non-Hodgkin’s lymphoma. Hogan announced in June that he had been diagnosed with the disease but said doctors had assured him his prospects for recovery were good, writes Michael Dresser for the Sun. GROUP SAYS MD NEEDS TO ADDRESS CANCER: Maryland earns high marks for some of its cancer-related health policies, but needs to put more effort into preventing lung and skin cancer, according to a new report from the American Cancer Society Cancer Action Network, Daniel Leaderman reports for the Daily Record. Specifically, lawmakers in Maryland need to provide more funding to programs preventing tobacco use and should do more to prevent minors from using indoor tanning devices, according to the society’s annual “How Do You Measure Up?” report, a state-by-state review of cancer-related policies. EDWARDS FIGHTS FOR NALOXONE: One family’s tragedy began U.S. Rep. Donna Edwards’ efforts to put naloxone, a prescription nasal spray commonly known as Narcan, into the hands of more people. When administered, the medication can immediately reverse the effects of a heroin overdose. Since 2009 Edwards has tried to get a bill passed that would create a grant program for local and state agencies to distribute naloxone and provide training, Elisha Sauers reports in the Sun. LEGGETT WON’T RUN: Three years before the next gubernatorial election, a possible Democratic challenger to Gov. Larry Hogan says he won’t run. Montgomery County Executive Ike Leggett is the former Maryland Democratic Party chairman, and has been talked about as a possible candidate for governor in three years, Robert Lang reports for WBAL-TV. Scroll down to hear Lang’s interview with Leggett. MO CO SCHOOLS DEBATE HOLIDAY CLOSINGS: Maryland’s largest school system is considering a policy to guide decisions about its annual school calendar, a move that comes nine months after officials set off a wave of public anger by scrubbing the calendar of religious holiday names,including Christmas. Donna St. George of the Post reports that the proposed policy does not revive the hot-button issue of identifying religious holidays on the document, but it touches on a related debate in Montgomery County: Under what circumstances should schools be closed on religious or other occasions? TOP EHRLICH AIDE DIES: Steven L. Kreseski, Gov. Bob Ehrlich’s chief of staff who was considered a mentor to many Maryland Republicans, died Friday from hereditary lung disease. He was 58, writes Luke Broadwater of the Sun. Both Ehrlich and current Gov. Larry Hogan visited Kreseski at the University of Maryland Medical Center, where he was being treated.